Remember, these pages are deliberately brief and intended mainly as quick references. The Prezicasts give more detail, and there will be a class in week 4/5, including a synchronous session for online students, which will introduce the model thoroughly. Prezicast: Follow this link to see the online version of the Prezicast on Subjective Values. Remember that the offline version is in the course Dropbox. If you want advice on how to use and view the Prezicasts, see the full listing. Way of valuing information: Subjective, through personal preference (“I like this”, “I need this”, etc.). Cognitive authority in this case becomes manifested in personal constructs (Kelly 1956 [see the ‘literature‘ page]); these are often held at a largely unconscious level, and may persist even in the face of information that challenges them (‘I am healthy’ is an example of such a construct). 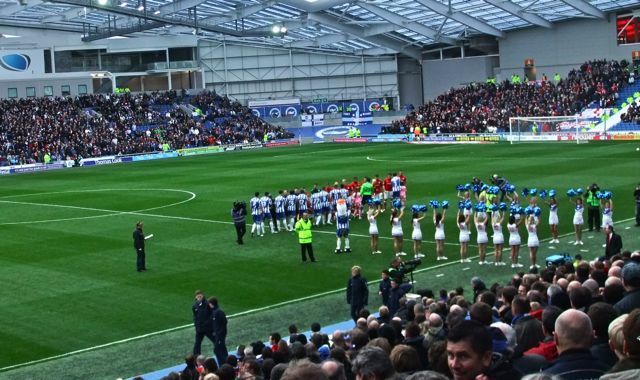 The Amex stadium, Brighton. Your course tutor has occasionally been known to adopt a subjective attitude to the team about to start play here, in blue & white. Others will support different teams or not follow the sport at all. These kinds of subjective preferences guide a great deal of our informational activity. View of science (see Fay, 1975): Interpretive. Information is sought in order that individual preferences and thoughts can be understood. Practice: Situated. Filtering practice, value judgements, etc. are dependent on context, which is, ultimately, personal (though intersubjectivity always comes into a context as well; ‘personal’ constructs are propped up by engagement with other people). Level: The micro-level, the personal and individual. Structures of support: Structures of individual cognition (how we make meaning and knowledge from sensory input), learning , personality, memory, etc. Cognitive biases also come into play (see the Prezicast on this topic). Form of literacy (Egan 1990): Comprehensive. Frames of information literacy (Bruce, Lupton and Edwards 2006): Learning to learn and personal relevance frames. Remember that these frames address the structures and practices on ‘their’ side of the triad. Thus, good practice here consists of understanding one’s context, one’s personal preferences (and biases) and the way we learn and make knowledge. Thus, we do not here just conform to correct practice, but inform ourselves of other practices. Pathology if omitted: ‘Groupthink’. A term first coined by Harold Janis in his 1972 book Victims of Groupthink. Groupthink is when an individual subsumes their own cognition under a group’s. There is no individuality, no creativity even – because creativity always consists of not just doing what one was told to do. If the subjective aspect of informational relationships are omitted, the individual will not question the information they have found. Ricardo Blaug in his paper “Cognition in a Hierarchy” – see the reading list – calls the same notion battery cognition, to represent the way that the individual’s thinking is “farmed” by an organisation, like a battery hen.